WikiLeaks founder Julian Assange cleared one legal hurdle last week when he was granted bail in the U.K. over sexual assault charges filed in Sweden. And as the embattled 39-year-old Australian hacker's lawyers fight his extradition, he'll be working on a memoir. The book will be published in the U.S. by Knopf, a division of Random House, and in the U.K. by Edinburgh-based Canongate. Canongate publisher Jamie Byng confirmed the news to DailyFinance by email, adding that the U.K. publisher was handling all translation rights. (A spokesperson for Knopf was on vacation and didn't return request for comment.) 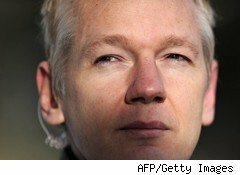 Caroline Michel of the U.K.-based literary agency Fraser, Peters & Dunlop brokered the English-language book deals, and both publishers expect Assange to deliver a finished manuscript by March, with plans to publish later in 2011. Interest in Assange is at fever pitch since WikiLeaks began disseminating more than 250,000 diplomatic cables in late November. Companies such as Visa (V), Amazon (AMZN) and PayPal have cut off the organization's ability to collect donations and existing funds, and Time magazine passed over Assange for Person of the Year, giving Facebook CEO Mark Zuckerberg the honor. As a result, a memoir from Assange is a logical step, since the book will have great interest for his many admirers -- and just as many detractors. Interestingly, news of Assange's memoir first came through in Spanish, when Claudio Lopez, head of the literary division for Random House's Spanish-language division Mondadori, posted a message on Twitter Monday afternoon. That's even more ironic since rights to the memoir haven't sold yet in Spain, though that will almost certainly change -- as it likely will in other countries around the world. Speaking of irony, what are the chances the book gets leaked before it's published?